Smooth and comfortable | What Car? If youre a gadget freak, all that might be enough to persuade you to buy an A7 before youve even driven one. Its worth taking a test drive first, though, because youll really rather like it. We tested whats likely to be the most popular A7, the 202bhp 3.0-litre TDI popular because if its stats: 53.3mpg and 139g/km of CO2. It makes do with two-wheel drive where the other models get four-wheel drive, and it has a CVT continuously variable auto gearbox where the others get a clever Multitronic dual-clutch auto. 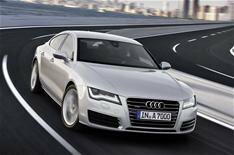 The A7 may wear a Sportback name, but this model never feels really sporty. The engine is smooth and refined, but lacks real punch. Theres plenty of grip even from this two-wheel drive car, but the steering always feels wishy-washy you turn the wheel and the car turns, too, but the steering lacks sharpness. However, this is an Audi that rides well at least on the optional air suspension of the car we drove. Its not perfect and can patter over broken surfaces around town, but its one of the most comfortable Audis weve driven in a long time. Its also one of the quietest, with next to no wind or road noise other than on rough road surfaces. A more powerful version of the same 3.0 TDI comes with Quattro, as do the 2.8 and 3.0 petrol cars. All models get stop-start, brake energy regeneration and other eco measures to lower CO2 and boost mpg.